The Sree Kollur Mookambika Temple is located in Kollur, Karnataka near the perennial River Sowparnika and the Kudajadri Hills. The town of Kollur is also known as Mookambika and is easily accessible from Tamil Nadu as well as Kerala. Devi Parvathi, in the form of Aadiparashakthy, is the principal deity of the temple and devotees from both Tamil Nadu and Kerala flock to the temple round the year. The Sree Kollur Mookambika Temple is also revered as one of the Siddhi Kshetras (abode of mystical powers) and also as one of the seven Muktisthalas. Goddess Mookambika, in the form of Jyotir Linga, is the principal deity of the temple. 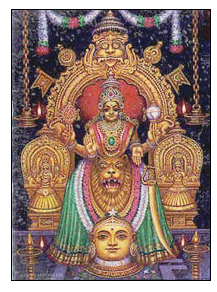 The temple was dedicated to Goddess Mookambika after she had demolished the demon named Muukasura. Goddess Mookambika is worshipped in the temple in all her three forms i.e. Saraswati, Lakshmi and Shakti. It is believed that it was Adi Shankaracharya, who had consecrated the Panchaloha (an alloy of five metals) image of the Goddess. Devi Mookambika is portrayed as holding a divine disc and a conch in her hand and has four arms and three eyes. The Sree Kollur Mookambika Temple was built by Venkanna Savantha of the Shaktha dynasty. Though there is absence of written records referring to the temple, there is abundance of other references detailing the significance of the temple. The town of Kollur was inhabited by the Shakthas called Kaulas, hence the naming of the town. The Sree Kollur Mookambika Temple was also raided and looted a number of times. However, most of the valuable treasures of the temple have been preserved and safeguarded. As per legend, Goddess Mookambika had appeared to Adi Shankaracharya near the Sankara Simhasan, after ardent prayers from him. Adi Shankaracharya had composed the famous ‘Sowdarya Lahari Sthotra’ in this very temple, glorifying the Goddess. As per the Skanda Purana of Veda Vyasa, the temple spot was blessed by Lord Shiva to become one of Siddhi Kshetras, after being extremely pleased by the devotion of Kola Maharishi. Lord Shiva named the place as Kolapura, in honor of Maharshi Kola, which later came to be shortened as Kollur. Lord Shiva also expressed that this place was to become the holy abode of Devi Adiparashakti. According to another legend Devi Adiparashakti was invoked by the holy Trinity i.e. Brahma, Vishnu and Shiva, to decimate demon Mahishasura (nephew of demon Kamhasura). Devi Adiparashakti, after annihilating Mahishasura, was requested by Maharishi Kola to stay at Kollur. The Devi granted Maharashi Kola’s wish and occupied half of the Lingam, the other half being occupied by the Holy Trinity. Later the Srichakra was invoked into the Lingam. Devi Adiparashakti killed Kamhasura, who was about to ask for a boon after performing severe penance to please Lord Brahma. In between these happenings Kamhasura did great penances to please Lord Brahma and he was about to ask for his much desired boon to rule the whole world when Lord Brahma appeared before him. But foreseeing the calamity Adiparashakti made him dumb making him incapable of asking his boon. Devi Adiparashakti was known as Mookambika since she had made Kamhasura completely dumb. Since its inception, the Sree Kollur Mookambika Temple has been open to devotees belonging to all castes, creeds and religions. The Sree Kollur Mookambika Temple primarily consists of the sanctorum, a hall and the Lakshmi Mantapa. The 135 feet long Lakshmi Mandapam has four pillars in it, which are adorned with the carved images of deities. The history of idol installation at Kollur Mookambika temple is nearly 1200 years old. King Halugallu Veera Sangayya is said to have laid the valuable stone to cover the inside premises and this was done by him under the instructions of Rani Chennamaji. The temple comprises of the sanctorum, a hall and the Lakshmi Mandapam at the rear. This Lakshmi Mandapam has four pillars and it is about 135 feet long. These four pillars are adorned with splendidly carved images of Indian deities. The entrance of the temple is adorned with an ornate image of Nrutya Ganapati (Lord Ganesha in the dancing posture). Images of Lord Ganesha can also be found in the Lakshmi Mandapam, Garbha Griha and the Mukhya Dwara. There is also a Deepa Stambha (a pillar which holds lamps) opposite to the Garbha Griha, which rests upon a Koorma Peeta (tortoise head). There is also a Shankara Peeta, which is believed to be the place where Adi Shankacharya had meditated. There is also an image of a serpent, which is ardently worshipped by devotees and is believed to remove the ill effects of Sarpodosha and other Doshas.